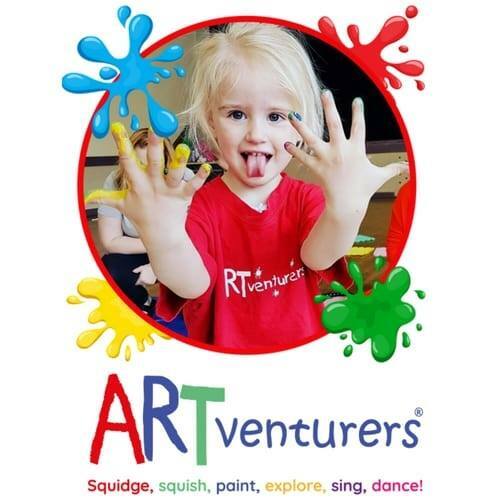 At award winning ARTventurers we run colourful, creative (often messy!) art, craft and creative play sessions for babies, toddlers and children as well as holiday classes and workshops, fantastic creative birthday parties, after school clubs and other events for children of all ages. 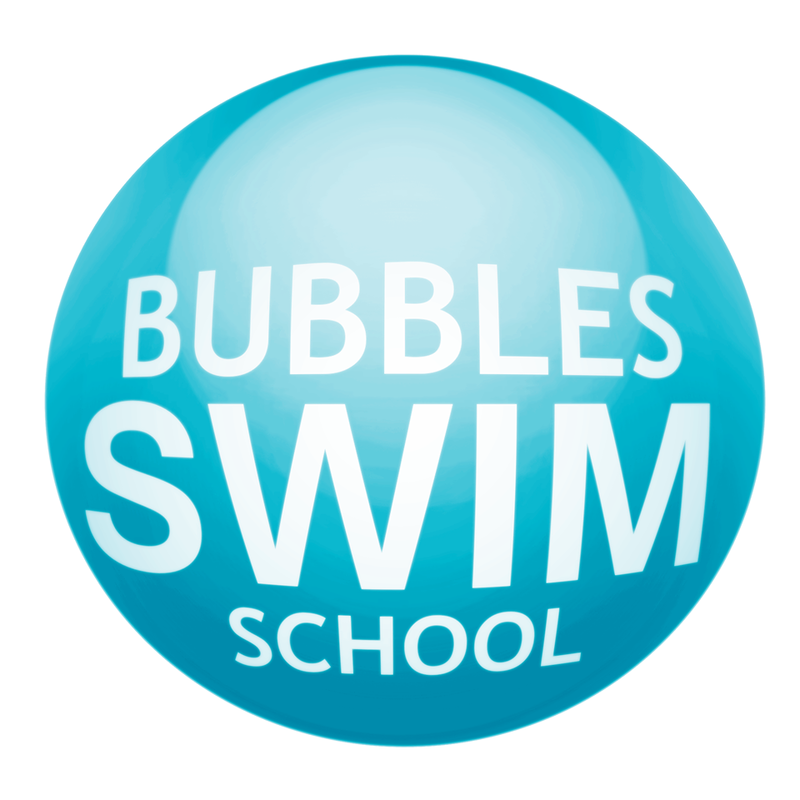 Classes suitable for children from 6 months – 4 years. Please visit the website or email catherine@artventuers.co.uk for more details. All classes last 1 hour, which includes our sensory activities and also time in the fantastic exploratory play area. You can join us at any time (pending availability) and your fee reflects the number of weeks remaining in the term. Please note, if a class is marked as ‘wait list’, please try to book onto another class to avoid disappointment. Once all class places have been filled, a place would not become available until the next term. 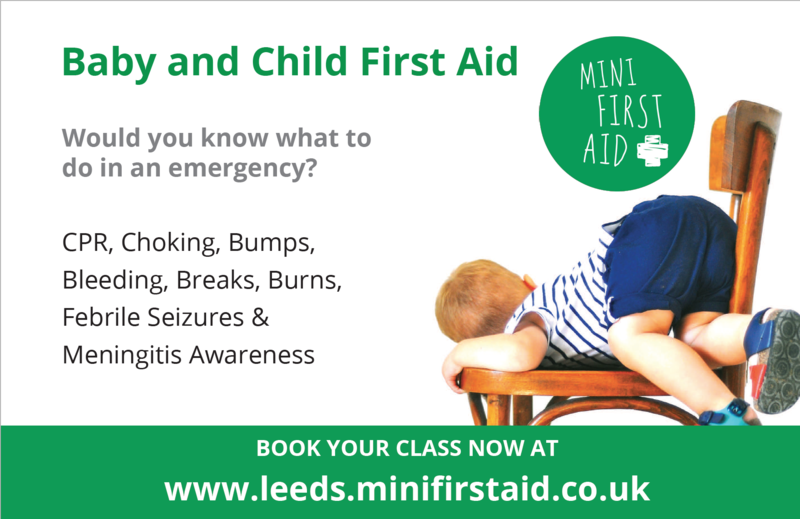 Alternatively email leeds@babysensory.co.uk or phone Sophie on 07976 754745 for more information. 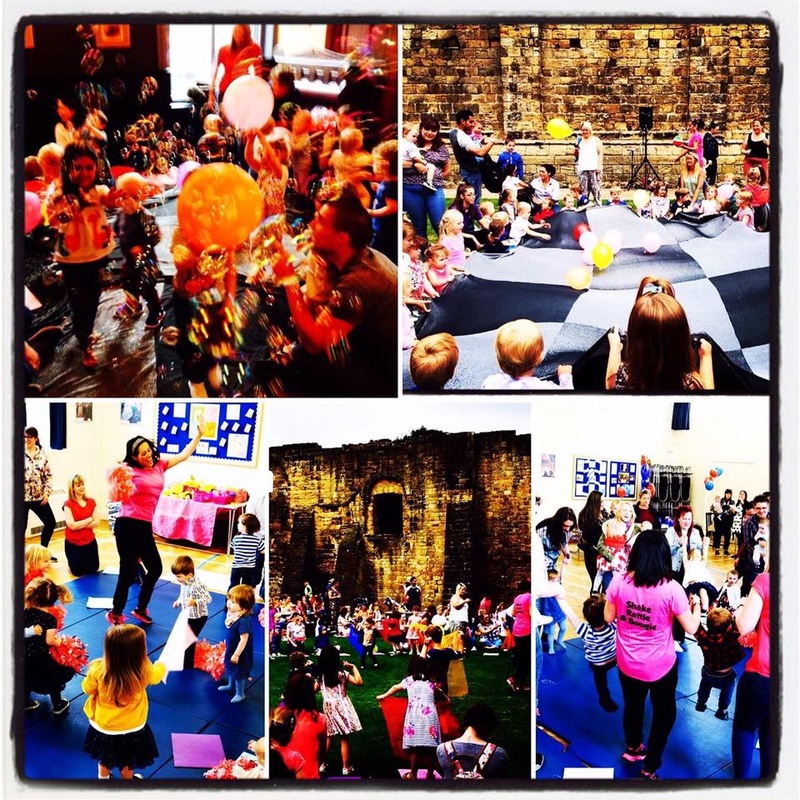 diddi dance North and Central Leeds offers funky preschool dance classes for boys and girls from 18 months to 5. We are the only preschool dance programme to explore over 16 different dance styles! From Charleston to Bollywood, each class is jam packed with dances, exercises, and the use of exciting props such as hula hoops, ribbons and a themed prop which changes each half-term. 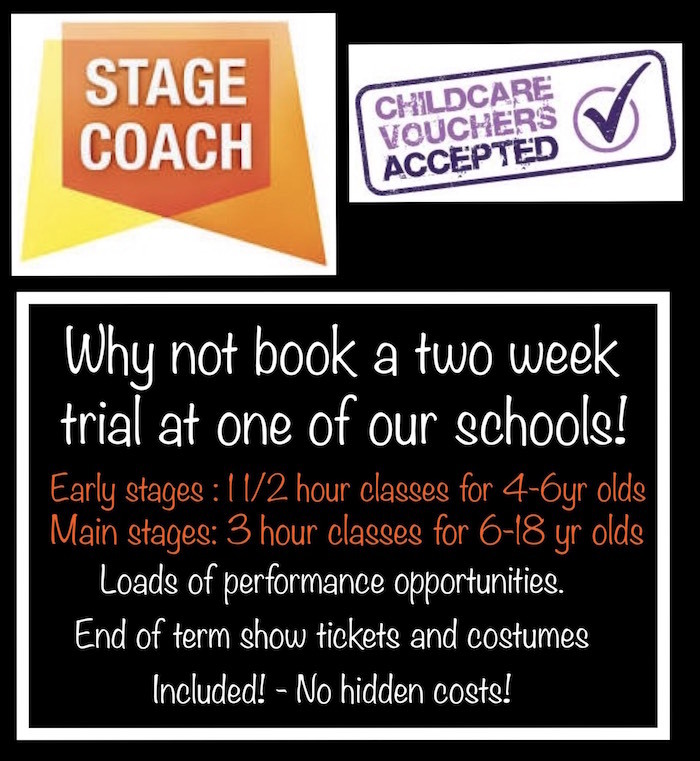 To find out what keeps children returning term after term, why not book a no obligation FREE trial class? 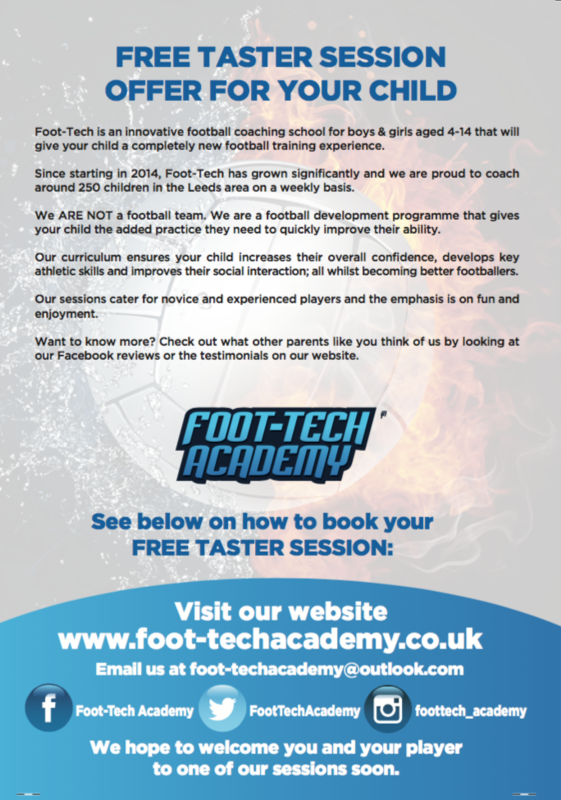 Head to the website to find out more and reserve your FREE taster session. Friday 1.30pm at: St. Margaret’s Parish Centre, Horsforth, LS18 5LA. 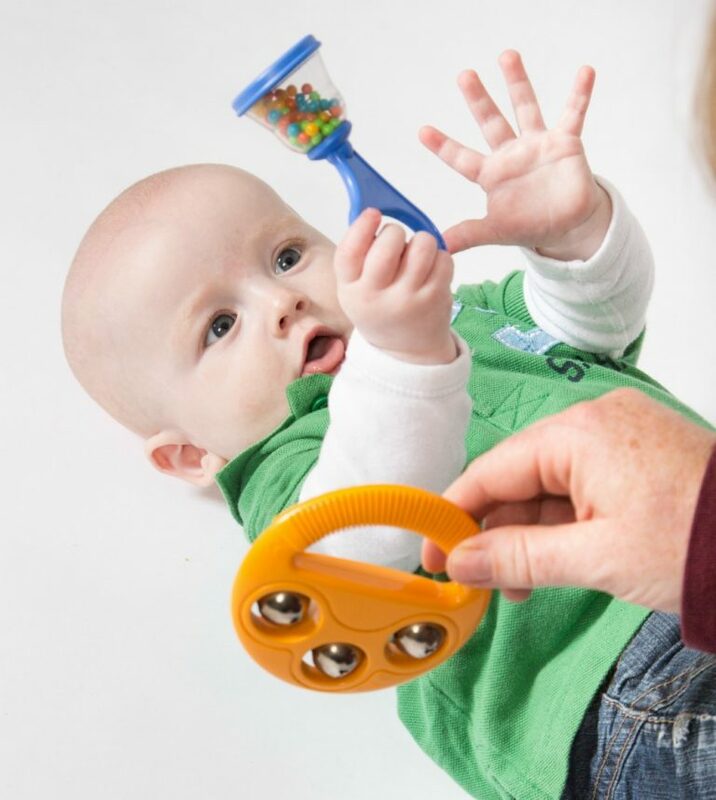 Rhythm Time Leeds award-winning, multi-sensory musical Young Baby Courses are suitable from birth to 6 months old. These fabulous courses are created specifically to help your newborn’s early development. It is perfect for babies that are only a few weeks old and the 6-week course is ONLY £30. Each week after the class we email the parent/carer with ‘Top Tips’ on a particular subject including ‘what your baby is saying to you’, Why your baby thrives on music and song and tips on tummy time too. Rhythm Time offers quality, fun music courses created to enhance and nurture your child’s development. The classes provide complete continuity for your little one from birth until school age. 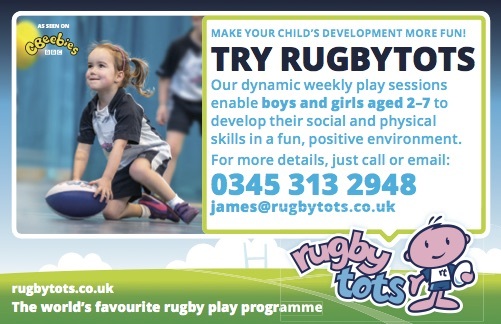 Watch your little one grow, and develop in confidence, creativity, listening skills, language, numeracy and co-ordination. Rhythm Time have been awarded the gold accreditation from the Children’s Activities Association which means we meet the highest standards in our industry. Young Baby Course (Newborn – 6 months)– If you have a newborn baby under 6 months, this is a fabulous course created specifically to enhance their early development. In their first few months, your baby’s main neural pathways are formed in their brain. 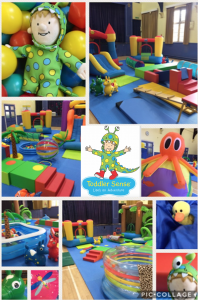 So this is the perfect time to help stimulate all their senses with our fun, multi-sensory sessions. 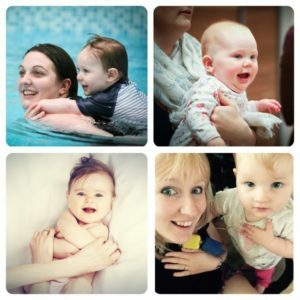 Baby (0 – 14 mths) Our activities help your baby’s speech, language, sense of balance and development of their inner ear. You’ll enjoy our catchy tunes as you have fun together exploring instruments and sensory equipment. Toddlers (15 mths – 3 years) your little one will love these fun classes where we help to develop their listening skills and improve concentration. Motor skills will be strengthened by using our lovely instruments, and their language will develop through singing and simple songs. Pre-school (3 – 5 years) Your pre-schooler will learn to conduct, listen, and compose through games and fun activities. At Shake Rattle & Boogie we provide exciting weekly dance and music classes for 0-5 year olds. You can choose to sign up for the whole term or if you prefer you can ‘drop in’ for a Boogie at many of our weekly workshops. If you are looking for a class that is full of energy and lots of fun then Shake Rattle & Boogie is definitely for you! 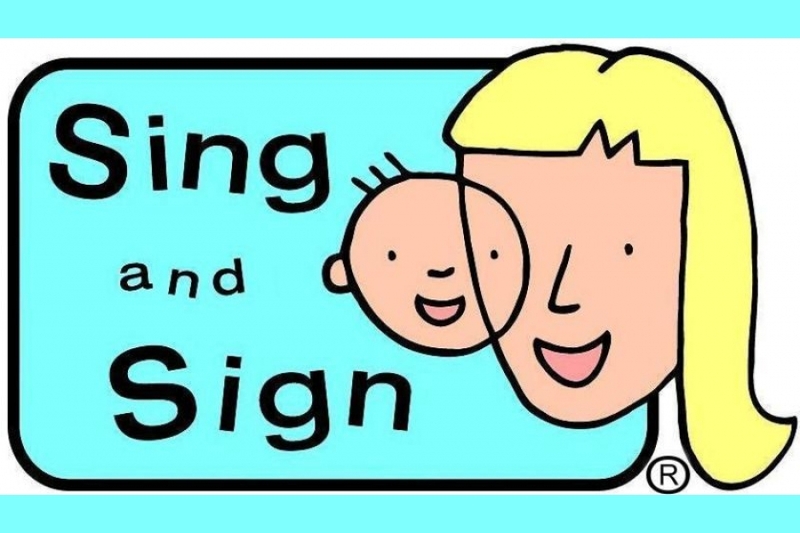 Baby signing is a fantastic skill to learn with your little one, enabling you to communicate with each other from an early age and encourage their social development. Our great fun, music based classes support your family, as you discover the benefits for yourself! Sing and Sign Babes is a gentle 5 week music and sensory course with an emphasis on communication. Suitable from birth to 6 months. This lovely class explores eye contact, gesture, and anticipation, together with lots of cuddles, tickles and some simple signs. All building the framework for communication, brought to you using our magic ingredient – music! The Stage 1 course introduces 6-14 month olds, and their families, to the wonders of baby signing. Over 100 signs are covered in the 10 week course, relating to daily routines (like meal times, getting changed, bedtime etc), animals, vehicles and lots more. The Stage 2 course gives 14-30 month olds, and their families, the opportunity to enjoy more complex topics, with more physical exertion! More animals to encounter, colours to explore, and lots of weather conditions to experience over the 10 weeks! As children develop speech, having the support of a physical gesture alongside emerging words, makes it much less frustrating for everyone! 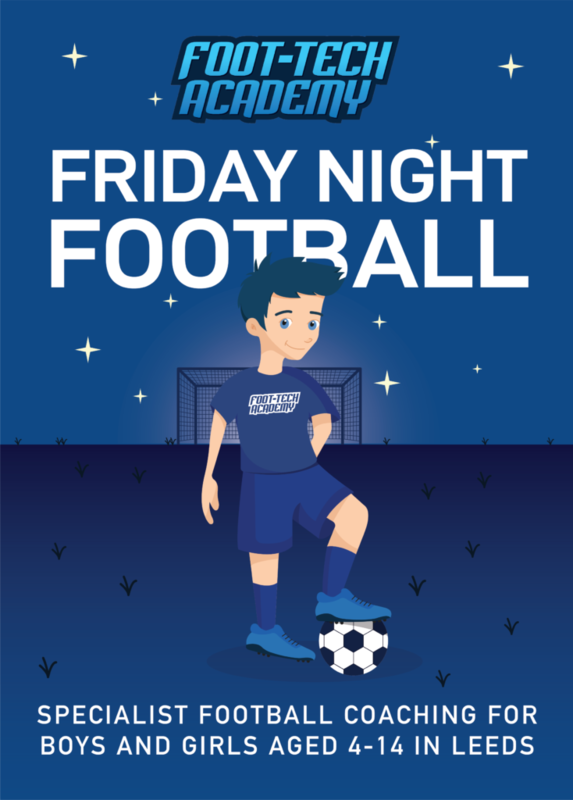 Venues: Classes run every day of the week in venues across North Leeds and Wetherby, for more details click here. Cost: Babes: £30 for 5 weeks, Stage 1 & 2: £62.50 for 10 weeks (No extra charge for multiples). 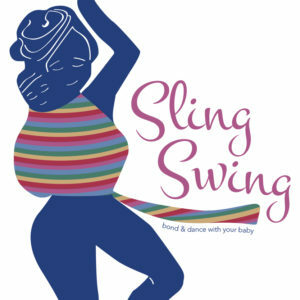 Sling Swing classes are for people who enjoy dancing with the benefit of being able to bring a baby along. We’re a unique parent and child dance class, designed for you to take part wearing your baby or toddler to build your bond and have fun in a social and lively setting! We have quality Connecta carriers available to borrow free of charge and I am baby wearing peer support trained so can fit you and your little one safely and comfortably at the start of the class. Suitable for babies from 6 weeks of age. 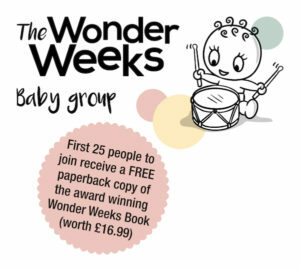 The best selling and award winning baby development app and book The Wonder Weeks are launching a new baby group in Leeds, starting Friday 26th April! 35 years of research by The Wonder Weeks shows that babies make 10 predictable, age-linked developmental changes (leaps) during their first 20 months. The Wonder Weeks Baby Group will help you spot leaps and support your babies development through these leaps, via an interactive, fun and engaging group. During each leap your babies will acquire lots of new amazing skills. Through play, music and sensory stimulation, the group will help you to support and maximise your babies development. Having a new baby can be rewarding but demanding. 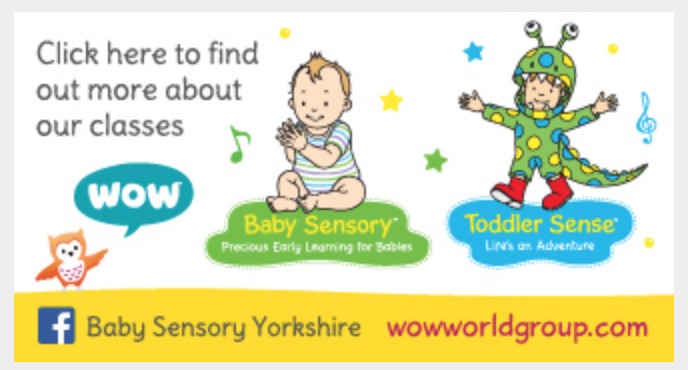 The Wonder Weeks research shows that babies become more teary, challenging and fussy at around the same ages when they are making amazing leaps! Whilst this development is something to celebrate, these stormy periods can be hard for parents to manage. To support you through the stormy periods we incorporate mindfulness and other soothing techniques in the classes, which you can use at home. 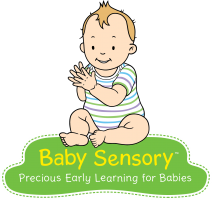 Toddler Sense is the next step from national award-winning BABY SENSORY. It offers multi-sensory, developmental adventures, including a Castles and Dragons fantasy, a Pow-Wow Native American party and Old MacDonald’s Farm this term. Classes that your toddler and you will love and have been planned by early-years experts to engage and amaze. New Explorers (13 – 20 months): Introduce your toddler to equipment and fun activities suitable for his or her age and stage of development. Adventurers (20 months – 3 years): Encourage your toddler to take on new challenges, learn new ways of doing things, and develop essential physical and social skills. Rangers (3 – 5 years): Build on previous skills learned, engage and participate with others, and become more creative and imaginative. AVAILABLE FOR BIRTHDAY PARTIES! 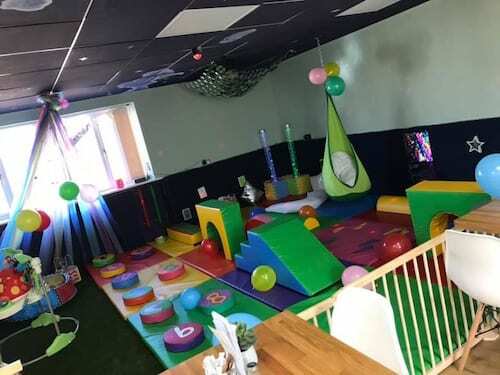 Lots of different themes to choose from, exciting soft play elements teamed with fun activities to get the party in full swing! Please email northleeds@toddlersense.co.uk for more information. For a list of the weekly Story and Rhymetime sessions at your local library as well as opening times click here. 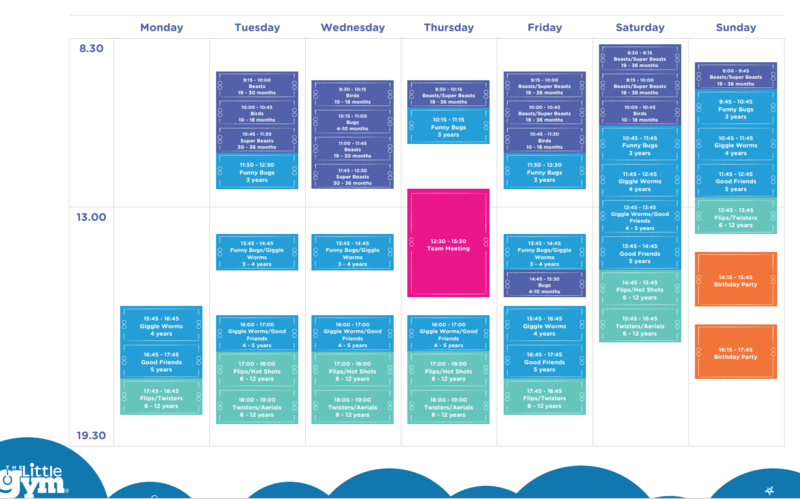 Winter 2019 (Jan – April) Programme. Relaxed, friendly playgroup. Reggio Emilia inspired. Explore sensory toys and natural resources with your baby. A slight change of focus every week …dinosaurs, the deep sea, space…all to inspire happy play! Good coffee, tea and home baked cake included. £4.50 – discount for siblings. Email: babyplaychapela@gmail.com or text Victoria 07494449788 to book a space. Puppets, music and movement to bring your little ones favourite stories to life! Suitable for Baby to 4 years old. £5 per family – Includes a hot drink, biscuits and a snack for the babes. Award-winning development classes designed to support you and your baby from birth. Regular exposure to an incredible range of sounds, smells, sights, textures, music, dance, signing and massage all help rapidly develop the brain in your baby’s first years. We’ve done the research; so you can enjoy the fun. Practice yoga together with your diddly one. Diddly Oms use specially adapted yoga moves to nourish the natural development of your baby. Incorporating postures and stretches for parent and baby with an opportunity to learn to relax together. Join us for Challah baking! Come and make your very own bread and play whilst it cooks – with messy play, sensory play & more! For children 0-5 years. £2.50 for 1 child, £3.50 for 2, £3.50 for 3 or more. Refreshments, bread and snacks included! Beanie Boppers is a new Dance and Movement class. With fun activities, games and dancing we explore new skills and stories without the strict discipline of a specialised dance class. Appropriate for confident walkers onwards. Bee Sharp sessions are for pre-school aged children from 10 months – 4 years. Each session has a theme and explores the basics in rhythm, tempo, pitch and dynamics through a variety of activities such as singing, playing instruments, movement, action songs nursery rhymes, stories and drama. The indoor group includes craft or baking, followed by a snack, songs, story and freshly baked bread. The outdoor group includes free play, followed by making food to cook on the fire, fruit, songs and seasonal stories. 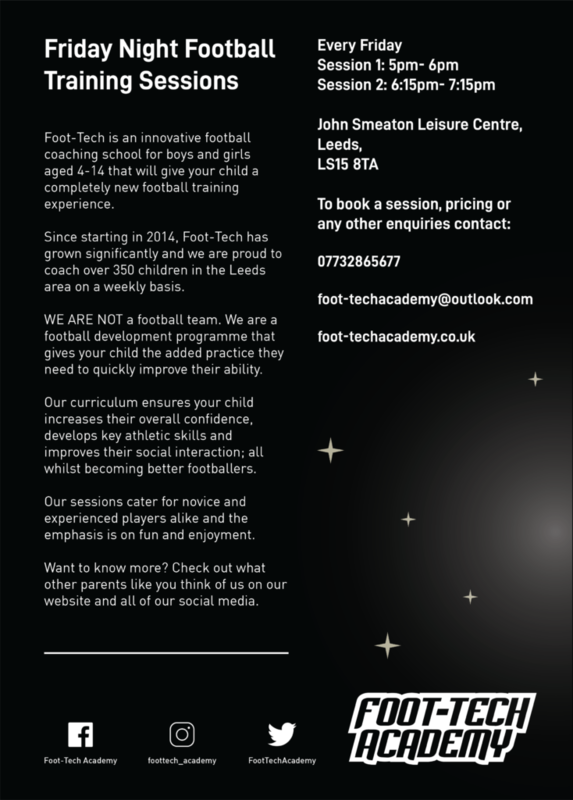 £6 per session for 1 child. £7 per session for 2 siblings. Pre-booking required. 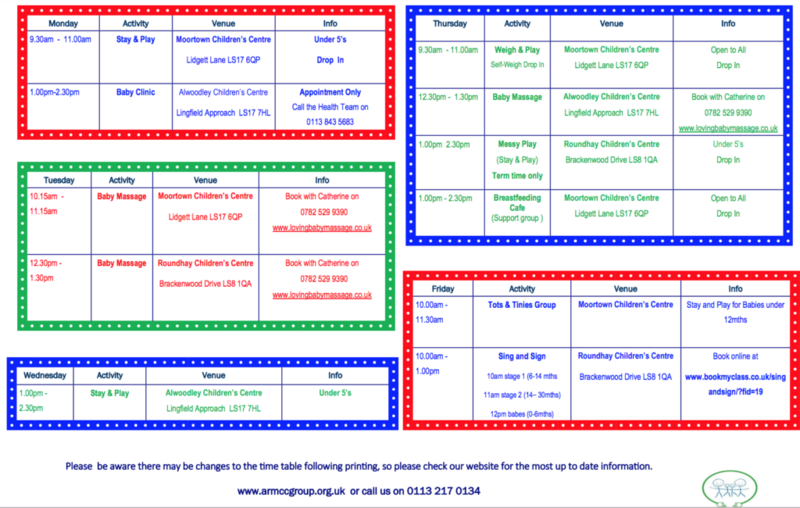 Fantastic Parent & Toddler Groups in North Leeds that Bounce and Wobble call Stay & Play. 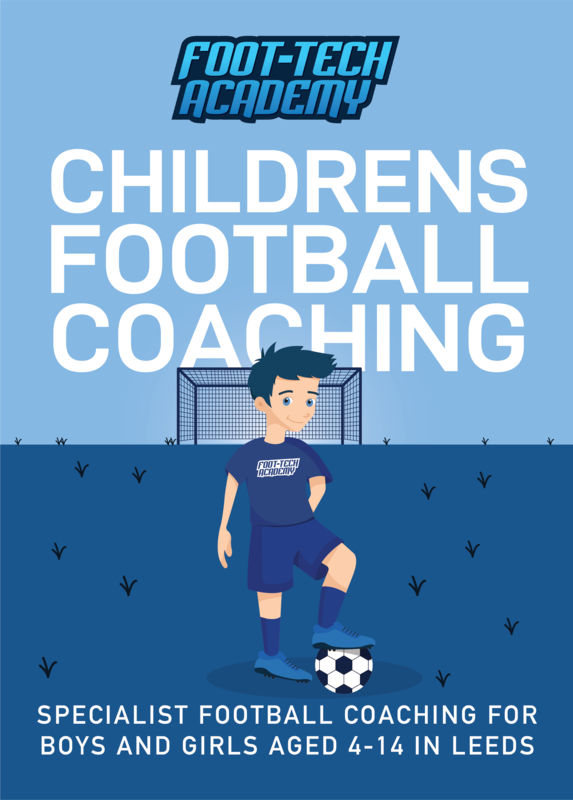 These sessions run most weeks at a wide variety of great local venues, offering the chance for your little ones to let off some steam while you relax with free tea and coffee!! 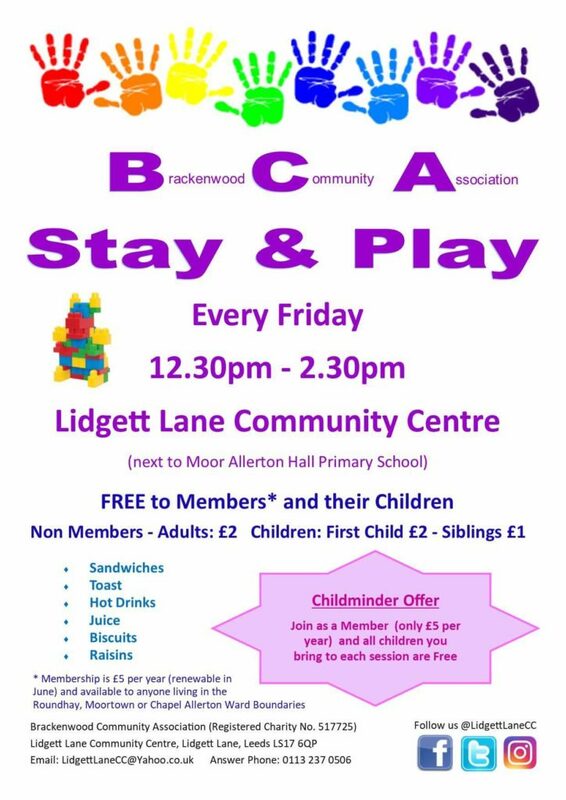 A welcoming environment where mums, dads and carers can bring their littles ones and enjoy a hot drink with a FREE brownie, whilst your children play. With a soft play, books and toys. There’s space for buggies, and baby changing facilities (inc nappies and wipes), and comfy sofas and chairs. Arts and crafts session for pre-school children at the Coffee Shop.Opportunity for parents to make friends, enjoy refreshments and the play area at Crag House Farm. Dream Time Baby Massage is all about supporting mums with babies in a safe, secure and welcoming non-judgemental and inclusive environment. Award winning, multi sensory, bonding experience for all involved. 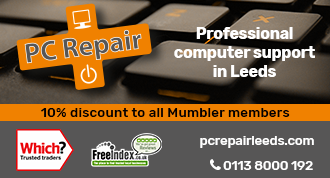 Available in Farsley and Pudsey. Babies and toddlers understand a lot more than we give them credit for, but they are often held back by their physical inability to talk. Each week covers a different topic such as basic needs, bedtime, animals, family, weather etc. We use props, musical instruments, bubbles etc. to enhance our sessions and ensure great interaction for babies and toddlers. Suitable for babies from 5 months to around 22 months. Providing fun & friendly dance classes for the wonderful people of Roundhay & surrounding areas since 2003. 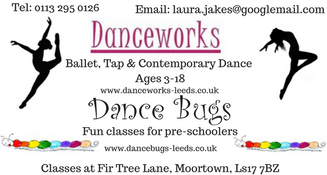 Ballet/Tap – Modern Jazz/Contemporary/Lyrical – Freestyle Disco/Street Dance – Cheerleading – Boys Street Dance – Adult Tap – Tiny Tots Ballet/Tap/Boogie. Classes take place Monday to Friday from 2 years – Adults. Classes will engage and educate your child, aiming to increase their awareness and provide correct pronunciation of letters and sounds. Learning through play is the main focus, enjoying music, movement, rhythm, rhyme, games, crafts and multi-sensory activities. Pay as you attend weekly classes. 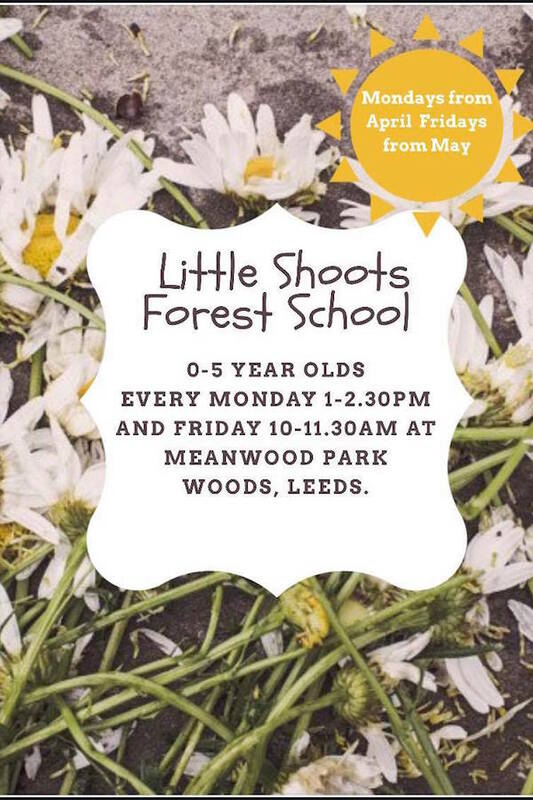 An hour of Forest School in Meanwood Park Woods for the under 5s and their grown up. Free play including: mud kitchen, hammocks, bug hunting, balancing rope, painting and a craft activity to take home. We will have a fire, toast marshmallows and have a hot chocolate. March Sessions will take place on 11th and 18th March, 1-2pm. 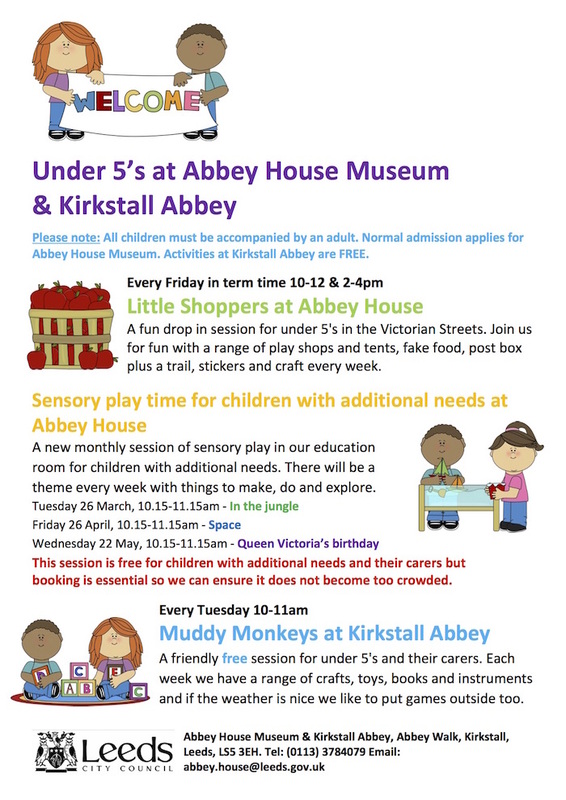 From April sessions will take place every Monday and Friday, 1-2pm. Classes involve a combination of exploratory play and structured activities to develop both gross and fine motor skills, as well as social interaction and communication. For toddlers to pre-school age. Available at Kirkstall, Holt Park and Scott Hall. Classes involve a combination of exploratory play and structured activities to develop both gross and fine motor skills, as well as social interaction and communication. For children aged 4 and above. Available at Kirkstall, Holt Park and Scott Hall Leisure Centre. A fun session for babies and toddlers up to 2 years old. A chance to socialise, meet new people, play and learn. Includes sensory play, messy play, outdoor play, singing and books. A free drop-in Baby Cafe providing information and support (and homemade cake!) 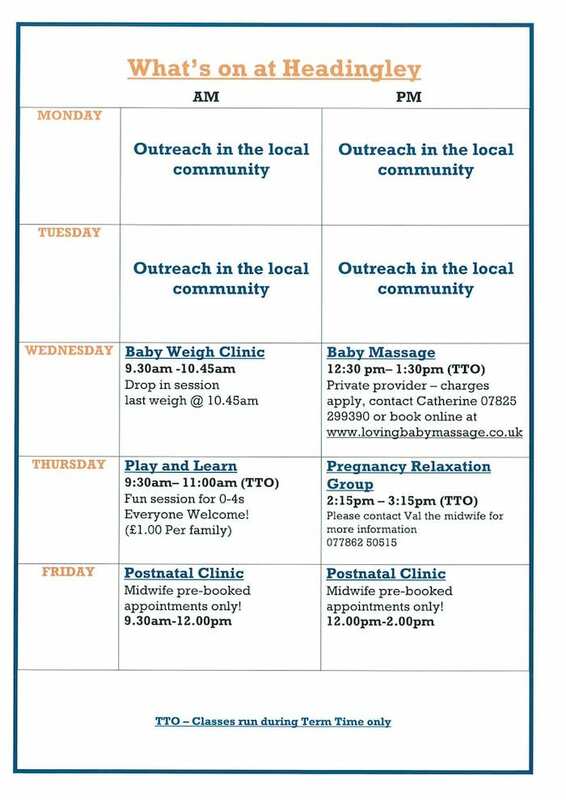 for pregnant and breastfeeding mums and their families. 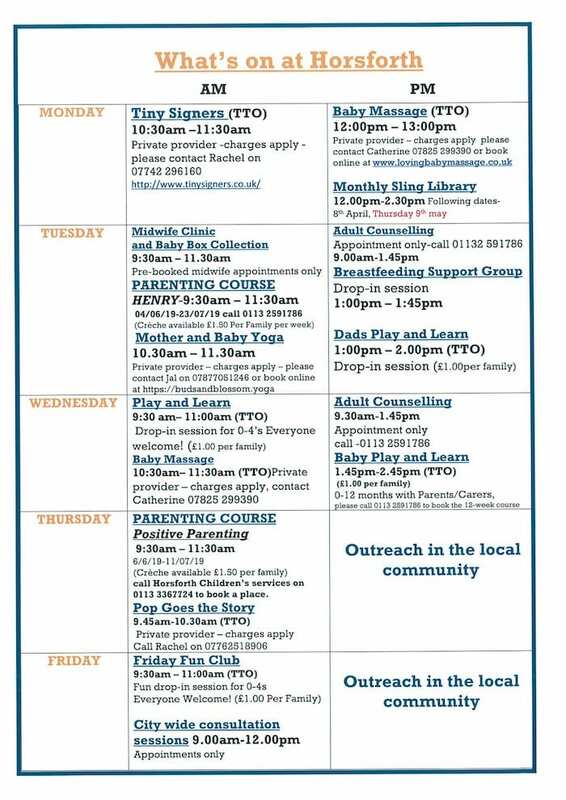 It’s a part of NCT and is an amazing resource for new mums as they can come along for and get free support from an IBCLC. Fun and exciting classes for children between the ages of 1-6 years. Climbing is a great way to get kids out and about and enjoying sport. One adult can supervise up to two children (including babies) in the centre. Classes available on a Weds, Fri & Sun. Playgroup for children 0-4 offering soft play area, quiet room, toys, craft activities, rhyme time and healthy snacks. Plus tea and coffee for adults. Donation of £1.00 per child and 50p for any subsequent children. Courses teach a range of exercises to do with your baby. These are done with interactions and singing. Classes are always baby led. The exercises are great for babies physical development. Baby Stay and Play run by a qualified Early Years Professional; bringing a range of baby related activities. For babies under 1 years. 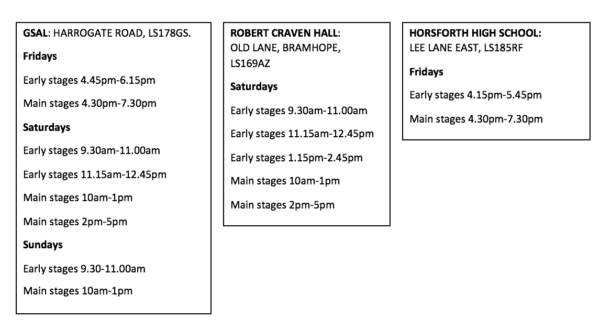 YOGA: Temple Newsam (Mon), Morley (Weds), Yeadon (Thurs), Horsforth (Fri). The group will provide your little one with the opportunity play creatively and safely as well as joining in with singing time. Singing time will include all the classic songs that you will be familiar with but it will also be aimed at sharing our Christian beliefs through stories and simple songs. We Sing! We Moove! We Play! We Learn! We Have Fun! Moo Music is great fun for babies, toddlers and parents/carers too. Sessions are enjoyable and interactive and will help your child gain confidence, develop memory and language and coordination skills in a multi-sensory way. Sessions include: Baby, Mini, Mixed, Story and Messy. Classes in: Yeadon (Mon), Scarcroft (Mon & Tues), Chapel Allerton (Weds), Alwoodley (Thurs), Adel (Fri). We aim to provide a safe and stimulating environment where children can play, learn, explore and develop and for the adults there is time to have a chat, a drink and meet with others with young children. There are craft activities, role play, sand and play dough, a range of age-appropriate puzzles, toys, bikes and cars and each session finishes with singing time. £1.00 for the first child and 50p for subsequent children. This includes coffee, juice and refreshments. Moortown Baptist Church, 204 King Lane, Leeds LS17 6AA . Tel: 0113 269 3750. At a Music Bugs class children do what they do best – singing, exploring, finding their rhythm and making friends. Dance classes for children aged 2-12 years. Dance styles include, Ballet, Musical Theatre, Modern Jazz and Freestyle. IDTA exams taken and children can take part in Dance School shows. Roundhay NCT Bumps & Babies meet Friday mornings 10am-12pm in the Terry Yorath House beside Street Lane Practise. Weekly donation of £2 and all you can drink coffee/tea/biscuits and chat, plus toys/equipment 0-4 years. Siblings welcome. Shadwell Tennis Courts, The Ginnel, rear of 153 Main Street, Shadwell, Leeds, LS17 8JD. We welcome parents or carers and babies and toddlers into the groups for play, chat, refreshments and fun. St Andrews Roundhay United Reformed Church, Shaftsbury Avenue, Leeds LS8 1DS. Craft activities every Friday for the under 5s and their carers (Free, drop in). We provide the theme and materials – you add your own bit of creative magic! Every Friday from 10am – 11.45am. Toddler jump is a 1 hour jump session for children aged 2-5 years. Children must be accompanied by an adult. We are mini has a stay and play room for kids to meet new friends through play. They also provide weekly activities to entertain the children. Stay and Play also offers Story or Rhymetime slots each day, to engage and entertain your Mini with their favourite books and songs!